"You must feel the Force around you. Here, between you… me… the tree… the rock… everywhere!" The Force is all around you. It can be a powerful ally. 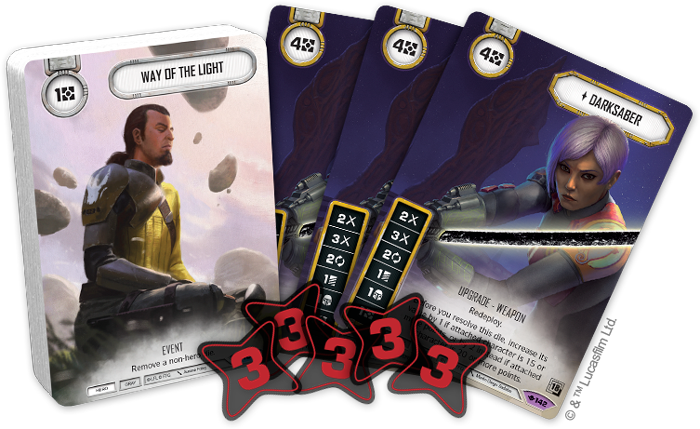 And if you master your deckbuilding with the recent Way of the Force Booster Packs, you should fare well in your confrontations during the third season of 2018 Star Wars™: Destiny Organized Play! Designed to help you meet more players and enjoy more games, the Organized Play program for Star Wars: Destiny features multiple levels of events—running from the seasonal Clash of Fates Tournaments you can enjoy at your favorite local game store, through the Galactic Qualifiers that take place at select conventions, and all the way up to the game's pinnacle of competitive play at its World Championship. But no matter your aspirations, your journey begins with your local retailer. Only a fully trained Jedi can possibly hope to conquer the world's best Star Wars: Destiny players, and the seasonal events at your local retailer are your training grounds. Only there can you complete your training—and win custom prizes for doing so! Reach out with the Force to find an Organized Play event near you, and you might do more than complete your training—you might also discover new deck designs and claim one or more exclusive Season Three prizes. Whether your event organizer uses the contents of the Season Three 2018 Tournament Kit to support a Clash of Fates Tournament, a local league, or some other style of event, your participation will put you in the running for one or more of the kit's seventeen Core Prize Cards, three Elite Prize Cards, and two Elite Prize Sets. 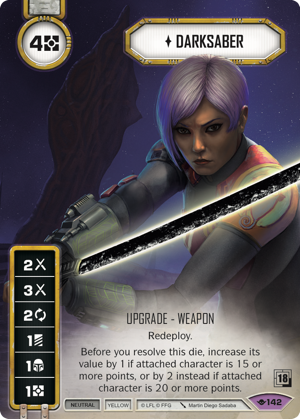 One of the Core Prize Cards and one of the Elite Prize Cards are intended for the event organizer—to keep or distribute at their discretion—but the rest are up for grabs, awarded to the players who most successfully engage in their "What if?" Star Wars: Destiny dice-and-card battles. 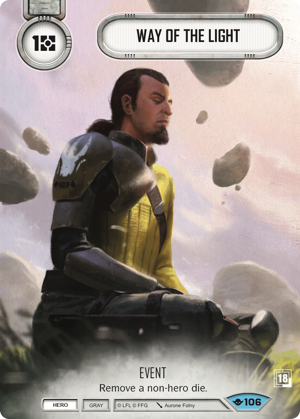 Finish among the Top 16 participants, and you will claim an alternate art copy of Way of the Light with artwork by Aurone Folny that depicts Kanan Jarrus deep in meditation. This common card is the perfect counter to the dark side's anger, fear, and aggression. For one resource, it allows you to remove any non-hero die, even allowing your Jedi to stand without fear against an AT-AT or Planetary Bombardment. Finish among the Top 4 participants of your local Organized Play event, and you'll be able to choose from among the event's Elite Prize Cards and Elite Prize Sets. If you choose the Elite Prize Card, you can face your future opponents while wielding an extended art version of the powerful Darksaber. Even if you follow the way of the light side, you will likely deal—or at least suffer—damage during your matches. After all, the conflicts of Star Wars: Destiny are fast and furious, with plenty of back-and-forth action. 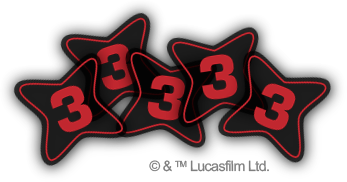 Make your way into the Top 4 at your local event, however, and you might be able to claim one of the sets of acrylic damage markers available in the Season Three 2018 Tournament Kit. Featuring red paint atop a smoky background, these damage markers can lend a sense of nobility to the damage you suffer—or if you use them to track the damage you deal to your opponents, they may serve as a subtle reminder of the lure of the dark side. Whether you're a Jedi Master or a Padawan looking for your first introduction to the Way of the Force Booster Packs and the many possibilities they represent, the Season Three 2018 Organized Play events at your favorite local game store are your training grounds. Meet new players, play more games, discover new cards, and master new strategies. A whole galaxy of adventure awaits you with Star Wars: Destiny Organized Play. Talk to your local retailer to learn how you can get involved!